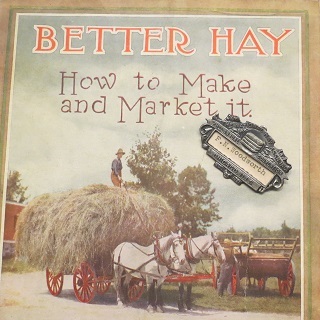 Prior to 1893, packing, shipping and handling hay was an irregular business. There was no established custom to govern, and every transaction was typical of the parties engaged in it. Balers and shippers followed the best of their own inclination in the detail of baling, weighing, and buying and shipping and distributing markets: also points of consumption were under local influences and often dominated by whimsical notions, and at the same point of shipment or in the dame receiving market there were irregularity of method of inconsistency in business, each individual conducting his business in a manner which seemed to promise him the largest gain, regardless of responsibility of his patrons and forgetful of self-accountability. 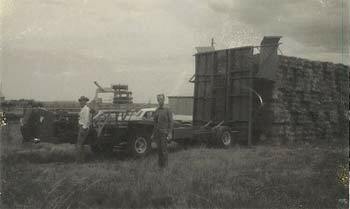 The hay crop had become the leading agricultural product in value, and its importance commercially was appreciated. The amount of hay leaving the farm had steadily increased, but trade environment did not offer much encouragement for business mean of regular methods, or the capitalist to embark in the business, and it was apparent to every thinking person that for the proper development of so important and industry it was necessary, in the interest of the producer as well as all others dependent upon it that there should be a strict application of regular business methods in order to counteract many of the handicaps on the business and to control those who needed control. There were some men then interested in the business who held this view, and among the Willie Bullock of Canajoharie, New York, who for some time had published the “Hay Trade Journal” and through its columns repeatedly urged reforms, also made suggestions for the improvement of trade conditions. He therefore felt the responsibility resting upon him to make an effort to put into effect some of the reforms he had so continuously and earnestly advocated. Early in 1893, Mr. Bullock invited a number of hay dealers residing in the state of New York to meat at Syracuse, and later included in his invitation a few dealers from other states. In response to this there came together fifty hay dealers. The call for this meeting did not contemplate an organization, but was intended to cultivate a more friendly feeling and to discuss matters pertaining to the hay trade, also improvements in methods. Interest was added by the exhibition of bales of hay furnished by the shippers in attendance. These were opened, and all present were given an opportunity to express their opinion in regard to quality, with the immediate result of bringing nearer together the divergent ideas of those present and clearly demonstrated that there was a wide difference of opinion existing solely because there had been no opportunity for conference and the benefit of others. All this made it apparent that some form of organization was necessary, and as a result semi-annual meeting were subsequently held at Syracuse, it being a central point. for a national association, therefore visited a number of cities in order to obtain the views of hay dealers generally in regard to the formation of a larger and stronger organization. Having received sufficient encouragement, Mr Bullock issued a circular calling a meeting late in 1894, but the time appointed not being generally convenient, it was postponed until January 22, 1895, where they came together at Cleveland, Ohio, a very representative body of hay dealers, and there was formed the National Hay Association, national in scope as in name. Considering that this was a meeting for the purpose of forming an organization, the objects of which were not previously known, it was remarkable that there were so many in attendance, and it unquestionably was to the benefit of the Association that the two hundred hay shippers and dealers who attended that meeting came together without any preconceived ideas, because every act of theirs was the result of honest opinion uninfluenced by selfish or sectional motives, and the adopted a set of grade rules which have remained practically unchanged, although there have been attempts from time to time to modify the for local or personally reasons.